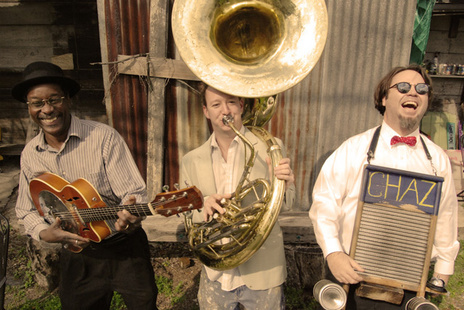 The Tin Men combine the unlikely instrumentation of sousaphone, washboard, and guitar to form one of New Orleans' most original and entertaining groups. Respected performers on their individual instruments, percussionist/vocalist Washboard Chaz, sousaphonist Matt Perrine and guitarist/vocalist Alex McMurray explore a truly eclectic array of North American Pop music from Jug Band to Swing Jazz to New Orleans R&B to Motowon to Easy Listening to Heavy Metal and beyond. "The Tin Men were so awesome. We've been getting compliments about them since Saturday night. They played their own set and picked their own songs and it made it so much more fun than having anything we could've planned out."